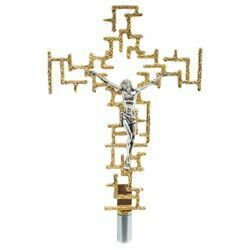 Wide selection of Crosses and Crucifixes, economic and handcrafted liturgical objects for homes, churches and sacred places: processional crosses, bases for atar crosses, small and big crucifixes for wall, Chorpuses Christi and Statues of Jesus. Crosses and Crucifixes made and finished by hand, manufactured by italian handcraftsmen from refractory clay, bronze, ceramic, wood, brass, terracotta and glass. They are high quality traditional objects of the catholic liturgy, ideal for decoration, celebration and display, with an excellent quality/price ratio. Quality 100% Made in Italy.